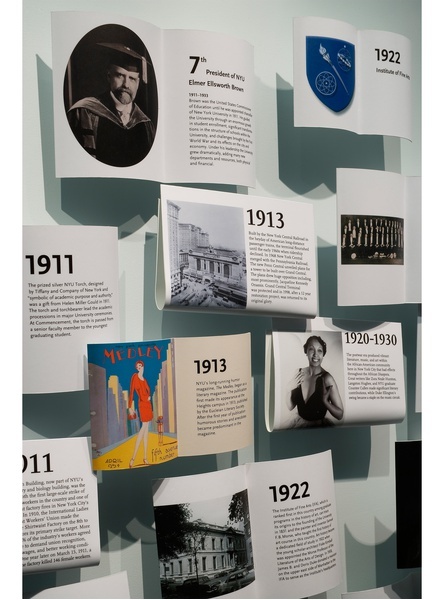 New York University’s Jeffrey S. Gould Welcome Center, located at the southeast corner of Washington Square Park, serves as the official gateway to the campus. It provides alumni, parents, visitors and friends a place on campus where they can enjoy continued connections to the university, and give prospective students an excellent first impression of NYU. 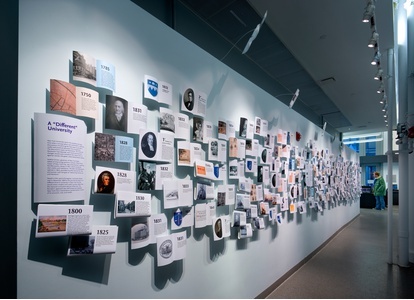 Following a renovation of the Center, the University approached C&G Partners to design a timeline exhibit along a well-traveled corridor that would allow visitors to trace the school’s history and the evolution of its ideals.Working with the University Archivist, CGP helped select and shape the content of the timeline, placing historic NYU events against a backdrop of national and internationally relevant facts. 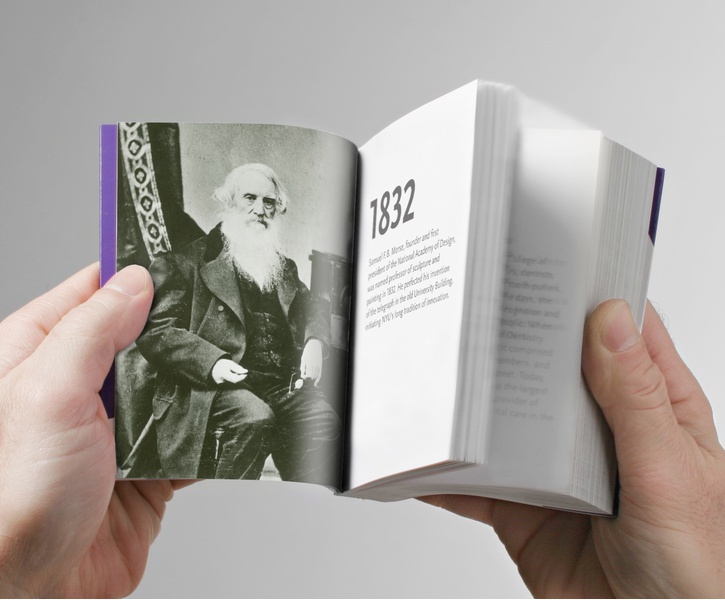 Two hundred pages of text and imagery arranged within a long, narrow space use the metaphor of an “exploded” book to tell the story of the 175-year-old institution.The school’s “liberal” philosophy provides a consistent thread across two centuries of development, from 3 to 50,000 students, from Washington Square to one of the largest landowners in Greenwich Village. 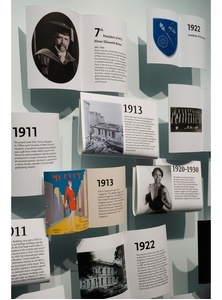 The welcoming design of open pages, a reference to the open-minded attitude that defines the school’s culture, carries across different page formats to unfold into a visual system for organizing different layers of information: pages folded like a newspaper showcase national and international events, book spreads display NYU facts, small color-coded pages inject fun facts, and oval-shaped images frame portraits of past university presidents. 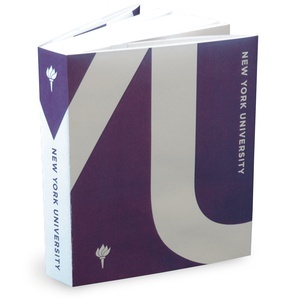 The results were so successful and the content was so interesting that the designer suggested and then created a 4”x5” little book as a memory safe keeper, that has become popular among NYU’s alumni.